1. 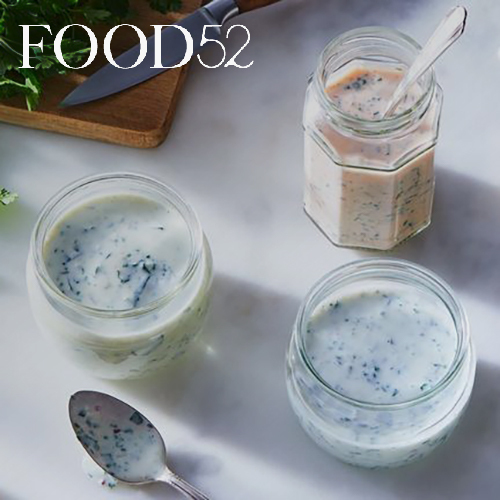 In a jar with a tight fitting lid, combine the shallot, herbs, garlic, vinegar or lemon juice, mayonnaise, and yogurt. Screw on the lid and shake the jar to combine. Stir in most of the buttermilk. Check for consistency, and add more if needed. Taste, then season with salt, pepper and paprika. If the dressing is too sharp, drizzle in some honey to mellow the acidity. Taste again, and adjust if needed. 2. Cover and refrigerate for an hour before using, to allow the flavors to blend and develop. 3. If you're in the mood for a dressing with a little bit of heat, simply add a tablespoon (or more, if you like it really spicy) of Sriracha. 4. If you're crazy about umami, add in a tablespoon of miso; this combination is killer on a salad or drizzled over a rice bowl. Because miso is a slightly thicker paste, slurry it up with a tiny bit of dressing before incorporating with the entire jar.